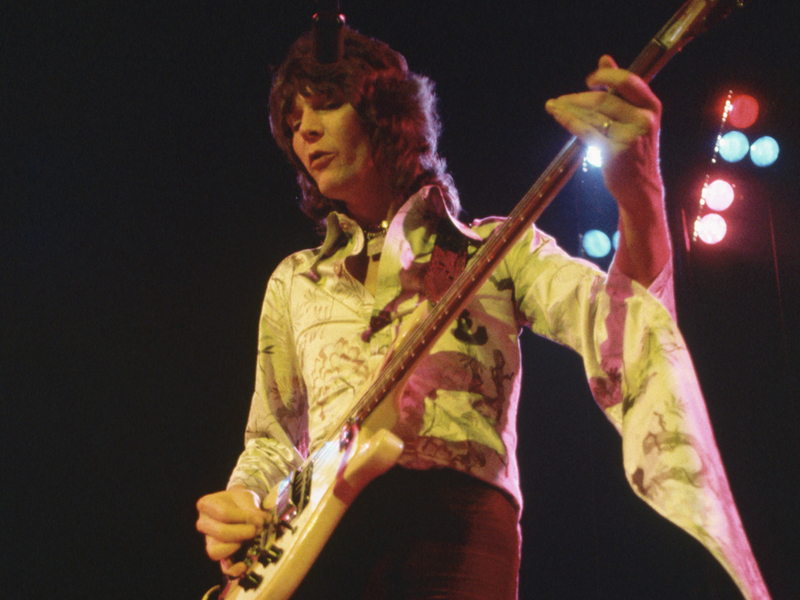 I was very sad to learn of the passing of Yes bassist, Chris Squire, who had been fighting leukemia. He was only 67 years old. Squire was often called the ‘linchpin’ of the band and is the only band member to appear on every album that Yes released. He began his life in music much the same as a lot of British rockers – playing in R&B cover bands, with a few Beatles tunes thrown in for good measure. He joined The Syndicate, which shortened their name to The Syn and released two psychedelic 45s in 1967 called “Created By Clive” and “Flowerman” (which was backed with their hommage to the counter-culture event at Alexandria Palace in 1967, called “The 14 Hour Technicolour Dream“). The band split shortly after and Squire joined another psychedelic outfit, Mabel Greer’s Toyshop, in 1968. He soon met Jon Anderson and the two decided to form a new group – which was called Yes, after a suggestion from original guitarist, Peter Banks. Yes released their first LP in 1969 and showcased a longer-song format, with flourishes of classical music and jazz – what eventually became known as ‘progressive rock’. Squire’s bass-playing was unique in that he played it almost as a lead guitar, with fluid lines and hitting notes in the upper register of the instrument. After a second LP, “Time And A Word“, released in 1970 – Peter Banks was asked to leave, as the sessions for the second LP were frought with tension. Steve Howe, formerly of Tomorrow and Bodast, stepped in for the third album (and the one considered to be the first ‘classic’ Yes record), called “The Yes Album“. It was released in 1971 and placed the band at the forefront of prog rock groups. Jon Anderson managed to poach our Rick from The Strawbs (abandoning Yes keyboardist Tony Kaye) for the fourth Yes LP, “Fragile“, which made them one of the top bands in the UK and even got them attention in the U.S., due to the radio-friendly tune, “Roundabout“. “Close To The Edge“, considered to be the best Yes album in the band’s catalogue, was released in 1972. Original drummer Bill Bruford left during the tour for the album and was replaced by former drummer in John Lennon‘s backing band, Alan White. A live album of the tour was released, called “Yessongs” (along with a film of the same name, directed by Peter Neal, shot at a Yes show in London). Back in the studio, they started recording what they considered to be their magnum opus, “Tales From Topographic Oceans“, based on Shastric scriptures that Anderson and Howe were reading. The final album was a sprwaling two-record set and even longtime fans thought it was too self-indulgent. Rick left after the tour and was replaced by Patrick Moraz, for the follow-up, “Relayer“. The band took a break in 1975 and a lot of the members released solo albums. Squire’s was “Fish Out Of Water“, referring to his nick-name and to his ‘solo’ piece on “Fragile”, “The Fish (schindleria praematurus)“. It sold well and is reckoned to be one of the better solo outings from members of the group. Yes reconvened in 1976 when Rick re-joined. “Going For The One” was released in 1977 and the band enjoyed a bit of a renaissance, even during the punk explosion. “Tormato” followed in 1978, but was not received as well and Anderson and Wakeman both left the band in 1979. A stop-gap live set, “Yesshows“, was released in late 1979. The band, with Squire, Howe and White soldiered on, adding Geoff Downes and Trevor Horn, from new-wavers The Buggles. They released one album together, “Drama“, before a disastrous tour in 1980. It looked like Yes, like many prog-rock bands of the 1970s, wouldn’t make it into the new decade. Jon Anderson started to work on some new demos in 1981 with Trevor Horn, original Yes keyboardist Tony Kaye and eventually Chris Squire and a new guitarist, Trevor Rabin. They were brought in to help fill out the sound. The new project was to be called Cinema – but was changed to Yes, as it seemed a more sound commercial appeal. This version of the band released the “90125” (after the Atlantic Records catalogue number assigned to it) and had a few hit singles. They toured again, playing some of the ‘classic’ songs alongside the new ones. Another studio LP, “Big Generator“, was released in 1987. The band split once again. Anderson reunited with Steve Howe, Rick and Bill Bruford (who had left the 1980s King Crimson line-up after Robert Fripp split that band once again). Squire owned part of the rights to the “Yes” name, so the collaboration was called “Anderson, Bruford, Wakeman & Howe” and released one album in 1989. A year later, it was decided to record an album with both of the 1970s and 1980s line-ups. The result, “Union“, was a bit too much of a mish-mash and contained too many tracks. I did get to see them live in Hartford, Connecticut on that tour in 1991 and I enjoyed the show. I preferred the 70s tunes more, but the ‘in the round’ set-up of the show and the revolving stage were pretty cool, too. Yes continued to release albums and tour up to now – with the line-ups ever-changing. Anderson finally left in the early 2000s, for what seems to be permanent. Squire was the one main-stay and now that he’s passed on, it seems to me that Yes has as well. They are going to tour with Billy Sherwood on bass duties – but to me, it’s just won’t be the same (it wasn’t the same without Anderson, either). Perhaps the remaining ‘classic’ 1970s line-up will re-form one last time and then call it a day. Rest in peace, Chris – thanks for all the music! Excellent tribute, sir. Don’t see how they can carry on without him – it doesn’t seem right. RIP, Chris. Thanks, S.B.! Yeah – very sad – with no Anderson and no Squire, it just ain’t Yes – to me, anyway.